All suits may look the same, but only one makes the difference. Tyvek® offers unmatched versatility, superior overall barrier protection, improved breathability and better garment durability. From general maintenance to boat manufacturing to pharmaceutical handling and chemical processing, Tyvek® is the protective suit of choice. Now you can see for yourself why only one suit makes the difference. 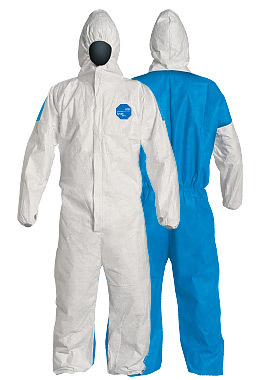 Tyvek® helps protect your workers against small hazardous particles, down to one micron. See what makes Tyvek® the obvious choice. Engineered for protection and comfort with DuPont™ Tyvek® 400 fabric on the front and DuPont™ ProShield® 10 fabric on the back. Ideal for applications such as pharmaceutical manufacturing, medical applications and more, offering Category III, Type 4-B, Type 5-B and Type 6-B protection. Will this be suitable for your hazard scenario? 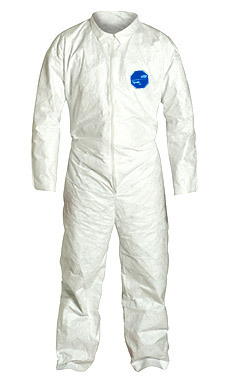 See the ideal balance of protection that Tyvek® offers by requesting a garment sample. Please contact me for another type of sample. YES, I want to receive updates and news from DuPont Protection Solutions. Copyright © DuPont. All rights reserved. The DuPont Oval Logo, DuPont™, The miracles of science™ and all products denoted with ® or ™ are registered trademarks or trademarks of E.I. du Pont de Nemours and Company or its affiliates.